Every community—whether physical or virtual will inevitably experience conflict. New ways of interacting through information and communication technology has led to new conflicts, such as domain name or e-commerce disputes. At the same time, governments need to deal with the entire range of disputes in society, whether crimes, neighborhood disputes, ethnic conflict, or disputes with its own employees. A key role for government and for e-governance is providing mechanisms to help resolve these disputes. The emerging area of online dispute resolution (ODR) potentially offers a useful set of tools and techniques for resolving disputes. 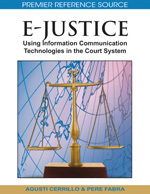 Capable of being used for both online and offline disputes, ODR has already proved that it can provide effective resolution for at least some disputes: more than 1.5 million cases had been successfully resolved online to July 2004 (Conley Tyler, 2005). Governments and e-governance institutions around the world are adopting or considering the applicability of ODR as a tool for digital government. ODR refers to dispute resolution processes conducted with the assistance of information technology, particularly the Internet. An “entrepreneurial” phase where a number of for-profit organizations launched private ODR sites (Katsh & Rifkin, 2001, pp. 47-72). ODR is now entering a fourth “institutional” phase where it is piloted and adopted by a range of official bodies including courts and government dispute resolution agencies (Conley Tyler, 2003). Two main forces have been driving the development of ODR to date (Conley Tyler & Bretherton, 2003). First, the difficulty of utilizing traditional dispute resolution methods in low-value cross-border disputes has led to interest in low-cost, cross-jurisdictional dispute resolution methods. This has been a particular concern for governments and intergovernmental organizations interested in fostering e-commerce (Federal Trade Commission, 2000; OECD, 1999; Trans Atlantic Consumer Dialogue, 2000). Without effective remedies in the “borderless marketplace,” where traditional court-based remedies are not a realistic option, consumers and business may decide not to transact (Consumers International, 2001). Consumer confidence is seen as a key issue in increasing the level of online commerce. At the same time, the forces that promoted alternative dispute resolution (ADR) as an alternative to court adjudication in recent decades are also driving the development of ODR. Some ADR enthusiasts have been motivated to investigate the potential of the online medium to provide more effective techniques for dispute resolution—in some cases, from simple curiosity (Raines, 2006). The search for more convenient, cost-effective, efficient, and durable ways of resolving disputes will continue for as long as disputes exist (Brannigan, 2004).